I’d probably be a bloody great king. If you ever see me say otherwise – I have – then know that I’m merely being humble, which is another reason I’d be an excellent replacement for any royal ruler. I can tell serfs where to go and chop down trees no matter how drunk I am, and I’ve been known to erect walls within minutes of thinking “I should erect some walls”. And there’s nobody that sorts out supply chains like me. You might not think that last part – or indeed any of those things – are particularly kingly, but you’d be wrong. I don’t know how many of those things will be in Grand Ages: Medieval, the sort of sequel to Grand Ages: Rome, but I’m guessing that at least one of them will feature. So I’m confident I’ll have no problem taking on the mantle of king in Kalypso’s real-time medieval city-builder. Take a gander at the announcement trailer below. There’s a regal beard in it, so that’s nice. 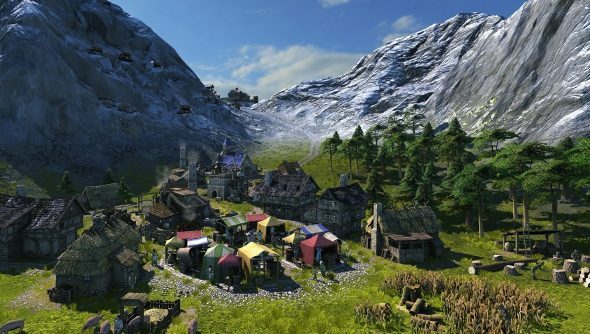 New rulers start off with a town, and through resource gathering, building and money making ventures, many more cities can be founded. What you’ll be wanting to do is build an empire, because emperors beat kings. If there was an emperor in chess, then people would complain that the piece was OP. Development duties have been given to Kalypso Gaming Minds this time around, the folk behind Rise of Venice and Patrician IV. I do love me some medieval city building, so I’ve been inspired to go back and play some Banished, which is just lovely, in a terrible, everyone is going to die and it’s all my fault kind of way.